The artist at sound check. Beware the Fog of Doom that’s enveloping the stage! Photo (CC-BY) MDL.hu. With a full length record, we also get a glimpse into sound design and live touch control, along with a cross-media event involving photography and sculpture. 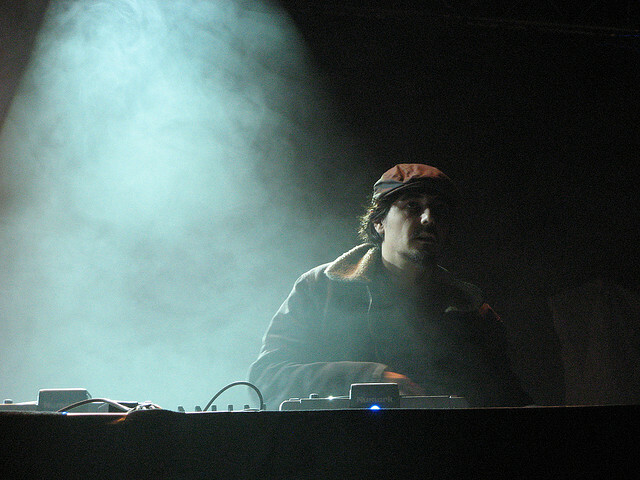 It’s the latest Amon Tobin, and for lovers of digital sonic manipulation, it’s big news. Amon Tobin’s ISAM arrived this week, and it’s an epic opus of ambience and digitally-sculpted sound candy. It’s digitally-distorted without being glitch, off on cinematic reveries through noise before breaking into the odd deep-bass break. It’s also a virtuoso solo album on digital control via the Haken Continuum Fingerboard. Like that instrument, it seems free in its exploration of sound space, totally untethered from gravity. A lot of it is pure synthesis, says the artist, though there are plenty of recorded vocals, too. (I assume when Tobin says there are “no samples,” he means “…of other people’s sounds,” as there’s definitely a lot of recording, unless he’s been holding off on us and he actually is a robot, thus making a direct digital connection to his computer.) I could imagine some finding the endless digital stretching effects and morphs and punctuation fatiguing, but tracks don’t overstay their welcome; each is a miniature sonic tableaux, and delicate moments balance the bass-ier staccato scenes. You can have a listen without any particular narration, but Amon makes use of the commenting feature on SoundCloud to provide little annotations about what he’s doing and what you’re hearing. The full album is available on SoundCloud and sounds reasonably listenable as a 128k MP3 stream – certainly good enough to determine whether you love or hate this, and whether you want to buy a proper, high-quality download. The installation. Saatchi Collection artist Tessa Farmer works with Amon Tobin on a collaborative installation that employs the creepy, beautiful organic dead insects and other creatures in her sculpture. May 26 – June 3 at (aptly) The Crypt Gallery in London – let us know, readers, if you’re in London and can make it. The AV show. Amon Tobin has made a lot of doing audiovisual performances. These promise to be particularly involved, however. The artist will be presenting a live audiovisual show for Montreal’s MUTEK on June 1, which I expect may prove to be a real highlight of this summer’s event calendar. Also in June, he’ll take the show to Berlin, Brussels, and London’s Roundhouse. The photography. Working with the same materials, there’s some heavily evocative photography to enjoy, too, available on the site. Put that in full screen, crank the album, and bliss out. I’ll be curious to hear thoughts on this.